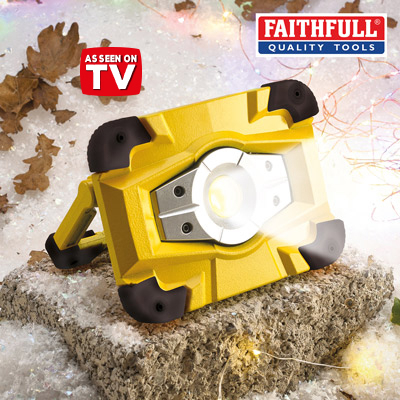 Faithfull 10w Rechargeable Work Light with Magnetic Base. Simply versatile, robust and very useful in many applications. An energy efficient and incredibly robust LED worklight producing 800 lumens of light output. Its compact size and heavy-duty metal case is drop resistant from up to two meters making this unit ideal for tough working environments. Combined with it’s slim profile and folding handle and detachable magnetic stand, is also very space efficient for storage. The heavy-duty internal Li-Ion 3.7V 4400mAh battery will power the light for up to six hours and may also be used as a power bank permitting the charging of most small electronic devices such as mobile phones, MP3 players or tablets that are now supplied with USB charging leads which can be connected to the lamps USB output port. Also supplied complete with 240V mains charger and 12v car charger.